If you are highly excitable intellectually or imaginatively, it is likely that you have a large number of interests, things you are good at and things that you would like to do. You might be considered a "rainbow person" or multipotentialite instead of a specialist (focusing on one main thing). If this is the case, it can be a challenge to decide what to focus on first. It's a great thing to have options, but not if it paralyzes you from moving forward. First it is helpful to get clear on your purpose, vision, mission and values as I discussed last week. But what if there are multiple ways to contribute to your purpose and vision? One tool I've found mighty useful for prioritization is Stephen Covey’s Importance-Urgency Matrix from 7 Habits of Highly Effective People. In his chapter on putting First Things First, he emphasizes that we should invest most of our energy on things we consider important in our lives. These include things that contribute to our overall purpose, vision, mission and values. First we manage things that are important and urgent. These include necessities, crises, critical activities, pressing problems and deadline driven projects. Next we focus on things that are important but not urgent. These include opportunities, important goals, long range planning, preventative maintenance, relationship building, personal growth and self-care. We aim to minimize things that are not important but urgent, which are interruptions such as some mail and calls, some meetings and some reports. Finally we avoid things that are not important or urgent such as trivia, distractions, some mail and calls, time wasters and busy work. Keep in mind that if you are spending a lot of time on distractions and time wasters, you might want to look deeper at your self-care needs. If you’re still not sure what’s most important to you, Kevin McCarthy uses a tool called the "tournaments" in The On-Purpose Person: Making Your Life Make Sense. This tool helps you get at your core wants and desires. List all of your wants/desires that you can think of. Write one on top and the next on the bottom of the page (to help spread out items that are alike). Write them on the branched tournament chart. Look at each pair, and decide which of the two you would choose. Work your way down until you get to the end of the page. If you have multiple pages, write the end want on each page on a new sheet. If your wants seem too broad to choose between using the tournament challenge, or you are trying to decide on an immediate option, you might try digging deeper into what you get out of each want. 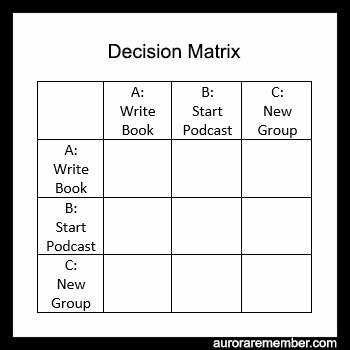 If you are trying to decide between different projects that you would like to do that all seem important to you, you can use a decision Matrix to help decide what to focus on first. For each pairing, decide which out of the two you would prefer to do. Count how many times you selected each choice. 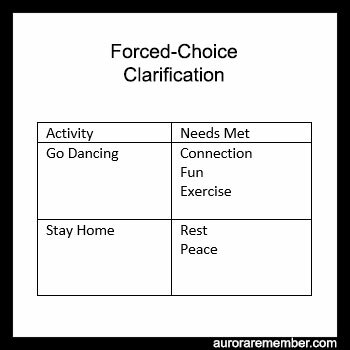 And finally, if you are looking for the biggest bang for your buck, I really like this Action Priority Matrix! It looks similar to the Importance/Urgency Matrix, but it focuses instead on Impact and Effort. First focus on "Quick Wins" - things that are high impact and low effort. These are the things where you will see immediate results. Then focus on "Major Projects," which have a high impact but take a bit more effort. Things that are low impact and low effort are considered "fill ins," while low impact and high effort items are considered "thankless tasks." Over my spring break, I chose to prioritize cleaning and beautifying my desk area. This was important to me because it is where I get my work done and it is also the focal point of my living room. During Anna Kunnecke's Queen Sweep, she challenged us to beautify one area of the home and this was one that would have the highest impact for relatively little effort. It meets the need for beauty and peace in the room I spend the most time in, which had been lacking for quite a while. Where's Your Zone of Genius?